I’ve been following the horror stories coming from Peru re. 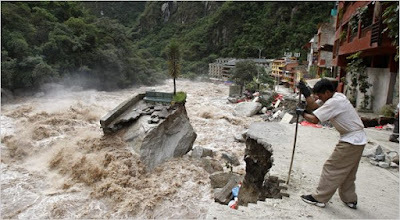 the floods and mudslides at Macchu Picchu. 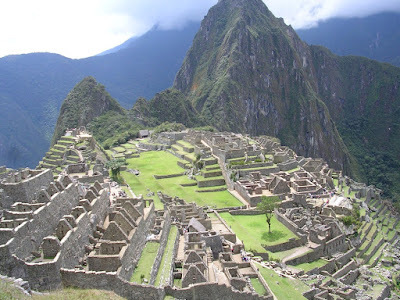 According to our tour group, the Peruvian government said it will take 7 weeks to rebuild the railway to Macchu Picchu. It's clear we will not be going to Macchu Picchu in early March. A representative of our tour agency said their travelers who are in Peru now have all been evacuated and they all decided to continue the trip. They are a lot more adventurous than I would have been. After an experience like that, I think I would just want to go home and crawl into bed for a few days. So we are now in the process of rescheduling the trip. If my husband and I were still working and had planned to travel to Peru over our Spring break, we would have had a major problem. But as retirees we are flexible about rescheduling. I had wanted to do take this trip in early March so it wouldn’t interfere with the beginning of the gardening season. I had thought that for the first time in my life, I would have time to do a real Spring clean-up. Also, once my little beauties start popping up, I just don’t want to travel. But as my husband says, you can’t forego travel anytime between early March and late September because you might miss the bloom period of a plant or two. He has a point. The travel agency said we have to be aware that the trip date could change once again, if the Peruvian government finds the damage is more extensive than they thought. It’s fortunate we can be flexible. We might have to reschedule this trip once again. When my husband and I were working, we only traveled during summer vacation or semester breaks. My husband often wanted to go to NYC for a week-end, but I was always too exhausted—too many papers to grade, classes to prepare, memos to write. In addition to my teaching job, for the past 8 years I served as president of Philadephia NOW. Juggling responsibilities from both my paid and unpaid jobs took up all my dwindling energy. I didn’t want to give up my volunteer job, which I enjoyed more than the paid job, so the consequence was total exhaustion. The impulse trip to NYC was out of the question. 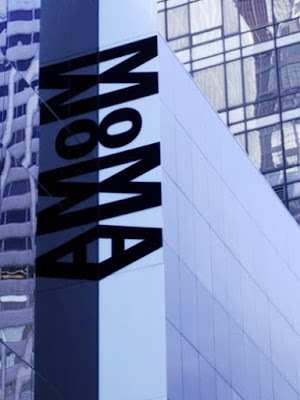 When we were working, we sometimes managed to get to NYC for major exhibits during summer and semester breaks. We rarely went to a relatively small exhibit like the Bauhaus show. Now we have the luxury of time (at least in the short run). These small exhibits can be very rewarding. I would never have gone to this on my own. This one was for my husband, who has a strong interest in modernism in general and modernist architecture in particular. But to my surprise, I really enjoyed it. Best of all were the textiles from the women of the Bauhaus. We’ll be taking more of these day trips to NYC. Given the cost of NYC hotels, we have to limit the number of weekend trips, but we are discovering how easy it is take a day trip. For the first time we took the Bolt Bus, which leaves Philly at 30th Street Station and in two hours arrives near Penn Station for a $26.00 a person round trip. At our age all that driving in one day is just too much. So, more impulse trips! After all, one of the best things about living in Philly is easy access to NYC! I am really really depressed. As a long-time progressive, activist I’ve dealt with a lot of political disappointments. The worst was the election of Ronald Reagan and the loss of all those liberal Democratic senators. That one changed my life. I abandoned my left wing view that participation in electoral politics was a waste of time, and became a Democratic committeeperson. I have toiled in the grassroots (and more recently the netroots) ever since. 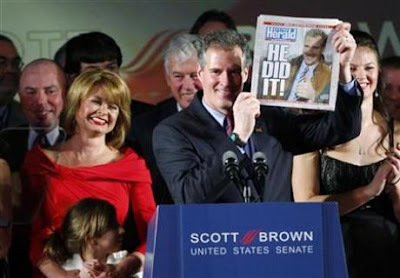 What happened last night in MA was especially hard after the euphoria of Obama’s 2008victory, and the probability that health care was finally within reach. Sure it’s not a perfect bill, but that’s how social reform in this country has always worked. First, establish the principle—e.g., everyone deserves to live in dignity in old age—and then work to gradually improve the legislation so more and more people are included. That happened with social security, with Medicare and it looked like it might happen with health care. I received an email from a good friend who lives in Cambridge MA; she expressed much of the anger and frustration I feel. I’m appalled at the outcome of the election. 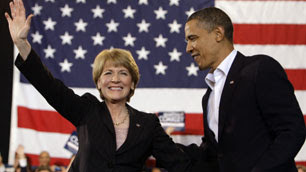 I’m furious at Coakley for not taking the election seriously and waiting so long to campaign. I’m furious at the DNC for not supplying support until it was too late. And I’m furious at (and very disappointed with) the voters of MA. The insult to Kennedy’s memory makes the Democratic loss even worse. I think my greatest anger is towards voters who only gave Obama a year and then faulted him for not having cleaned up Bush’s mess. Now, the day after, I can’t even listen to the news—any news—because I don’t want to hear about the election. I can see through my study window that tiny buds have appeared on the Rose of Sharon. I think I’ll spend the day contemplating them. I think my greatest anger is towards those who only gave Obama a year and then faulted him for not having cleaned up Bush’s mess. Back off the ledge my brothers and sisters, the Massachusetts election was not about Health Care or even Obama and progress. The voters simply did not like Martha. I personally spoke to about one hundred voters and not one told me anything different. Mass was not ready for this election so now we all have to dig in and work harder and longer but no one promised this was going to be easy. Marc and John are both smart, politically savvy guys. Hope they’re right. I love my house, but it has been problem after problem of late. The valves on all our ancient radiators went bad and did a lot of damage to our window sills; the roof over our front bedrooms needs to be replaced and on and on. My husband said, “Maybe we should never have bought this house." I was kind of upset by this. It was almost like a parent saying, “Maybe we should never have had this child.’’ He later said he didn’t mean it. Warts and all, I love my house. Even more I love my garden. 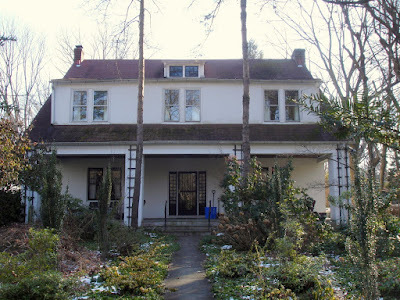 One of my recurrent bad dreams is that we have sold the house and I can’t get into my garden to tend my beloved plants. We bought the house largely for the garden. It’s not easy to get a city lot that it is a half acre. So okay, it may not have been the greatest investment, but I love it and I love my plants. They’re like old friends who for the most part reliably come back year after year. So I am trying not to get too bent out of shape by the latest problem: once again pipes built into the walls are breaking down, destroying the wall which will need to be cut so pipes can be removed and replaced. Then the wall will have to be replastered and repainted. I just hope it can be done before a 60th birthday party I am having for a very dear friend in late Feb. If not, I guess we’ll just all have to avert our eyes from the ugliness in my living room. Despite it all, I love my house, and we intend to say here as long as we can! My husband and I have traveled a lot but always as individual travelers. We wanted our freedom. We didn’t want to deal with some group leader telling us we had to get up at 6:00 a.m. to catch the tour bus, we didn’t want to follow somebody else’s itinerary—no, that’s not what travel is about. Also over the years, we’ve developed our style of traveling—spending a lot of time hanging out in cafes, doing less per day but really savoring each experience. I always felt so sorry for those tourists herded through museums with maybe a few minutes before each painting before being marched back to the tour bus. No, we would never travel like that. And in addition to being free to do what we like, part of the fun was trying to figure out how to get from place to place, to navigate the public transport systems. But now we are in our 60’s and we decided that for certain destinations maybe we should consider a group. We don’t need a group for Europe, but for a trip to Peru it might make sense. We’ve always wanted to see Macchu Picchu and decided it’s now or never. For people our age, the altitude might be a challenge; having the support of a group in case of altitude sickness might have its advantages. And, making all the arrangements ourselves would be much more expensive than the economies of scale we could get with a group. A tour agency which specializes in older travelers was highly recommended by some of our friends, so we decided to take the plunge and book their "Real Affordable Peru Trip.” When I first mentioned to my husband that this was a company specializing in senior travelers, he said, “I don’t want to travel with a bunch of geezers!” I reminded him that we too were geezers and perhaps he wouldn’t want to have to keep up with twenty year olds. Another challenge: my husband, who is something of a polymath, has a tendency to correct the tour leaders. Sometimes we've taken group visits to museums—usually when the only way you could visit was in a group. Correcting the tour leaders’ pronunciation/ information in a two hour one-shot museum visit was one thing, but this could get a little dicey if we’re traveling with the same group for a couple of weeks. So let’s hope he can keep this impulse under control. Anybody have any advice for two novices at group travel? I’ve never played the New Year’s resolution game, but this year I came to the conclusion that I need that kind of to-do list. One of the great rewards of retirement—all that unstructured time-- is also one of the great dangers. My husband I have developed the delightful habit of having 2 hour breakfasts drinking tea, reading newspapers and trying to catching up on the ever-growing pile of unread periodicals. We really like print and resist getting all our info on line. Much as I enjoy our 2 hour breakfasts, I must manage to get some work done each day. I’ve got to finish my history of second wave feminism in Philadelphia while I have (I think) full possession of my faculties. I’m sitting on a treasure trove of archival material that a graduate student in history would die for. I’ve promised those who gave me this material that I would tell their story. A friend suggested that I commit to 15 minutes a day. Now at that rate I’ll never finish, but I am going to try for 2 hours a day. I’m keeping track of how much I’ve done each day. On Jan. 2, I managed to do one hour—-but then I was cleaning up after our NY’s party. Without that 2 hour resolution hanging over my head, I’m sure I wouldn’t have done any work on this project. 1) Each day I will spend 30 minutes reading books/articles in Spanish. We booked a trip to Peru in early Spring, so I have an incentive to focus on Spanish. On Jan. 2, I actually managed 30 minutes. 2) Each day I will spend at least 20 minutes a day cleaning cabinets and emptying drawers filled with junk, tackling the dumping ground in our attic and the filth in our dungeon like basement. I didn’t manage to do this on Jan. 2 despite the modest 20 minute goal. This is going to be the tough one. 3) Each day I will swim or walk briskly for 30 minutes at least 3 times a week. If we are ever to manage Macchu Picchu, we need to be in better shape. No progress here on Jan 2. Well, we’ll see if this keeps me more focused on how I’m spending my time. 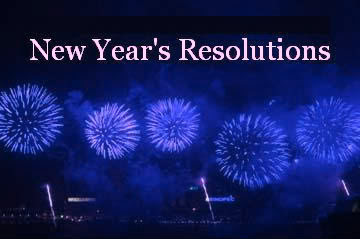 If anyone has any suggestions, for sticking to one’s New Year’s resolutions, please share.